Made from the reproductive organ of a bull, this unique shoehorn is perfect for those who have difficulty bending over to put on their shoes. At a length of approximately 34 inches (measurement taken from top of handle to bottom of shoehorn), you can remain standing, while using the shoehorn to easily slide your foot into your shoe. 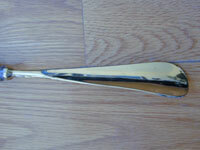 Bull shoehorn is reinforced with a steel rod. Available in horse, duck or snake handle (duck and snake not shown). Makes a thoughtful gift for someone who is disabled or for that person in your life, who seems to have everything. The art of making canes, putters and long shoehorns from the reproductive organ of a bull is a lost art from the days of the Old West that has recently been revived by artist, Ross Taylor. John D. (Doc) Holliday: a dentist by trade and a gambler and gun fighter by choice. Bat Masterson: famous frontier peace officer who made a name for himself in several of the wild cow towns of the west. Jack Dempsey: won the heavy weight title in July 1919 from Jess Willard and lost it to Gene Tunney in 1926. Available in lengths up to 35 inches long. To specify a length for your bull shoehorn, please type the length in inches into the Comments Section of the Order Form. Length must be specified or your order will be put on hold. If you want your shoe horn personalized, type your name as you want it to appear on the plaque in the Comments Section of the Order Form. Please verify the spelling. There is a $10 charge for personalization. Order your Ross Taylor Original Bull Shoehorn today!